Okay, I'm obsessed. I admit it. But it's so much fun to make things out of wire and beads! 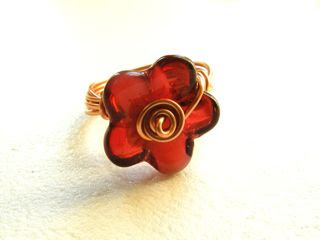 I made a bunch of rings like the reddish flower ring, but I don't really like wearing them. They were, however, fun to make. 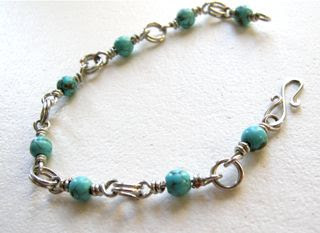 The silver and turquoise bracelet is made with 20 gauge silver wire and 6 mm turquoise beads. They are composed of simple wrapped loops and split rings with a hammered S-link clasp. It is very delicate and lovely. Too bad I didn't use sterling, but maybe next time. 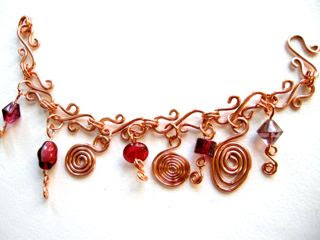 The copper and rose charm bracelet is from a tutorial by Connie Fox, one of my heroes of wire working. I've never met her but her designs really appeal to me. 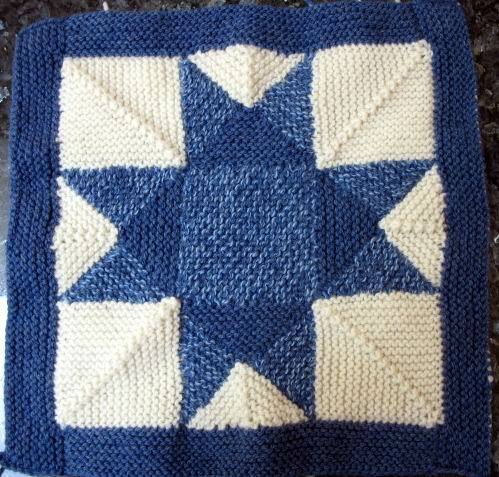 I've done a couple of her other designs too. 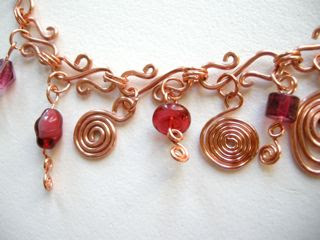 The main links are 14-gauge copper S-links, hammered slightly, and linked to together with 18-gauge copper split rings. The beads are sitting on 18-gauge spiral head pins and then connected with jump rings. My skills are improving, finally. How beautiful your work is! Please bring all tonight for us to show and tell. Don't forget the purple and red goodie.